Beatrice Prior lives in a futuristic society where there are five factions for the different traits people had, Abnegation for selflessness, Dauntless for bravery, Erudite for intelligence, Candor for honesty, and Amity for kindness. She is born in Abnegation, a faction that valued selflessness, but does not enjoy being in it. When she turns sixteen, she takes a test to see what faction she belongs in and chooses what faction she will go to, and then she learns a big secret she does not understand that could leave her dead if anyone else finds out about it. The next day, Beatrice and all of the other sixteen-year-olds go to the choosing ceremony where they choose which faction they will join, but Beatrice does not know whether to stay with her family or live her own life. Later, she starts initiation where she overcomes many difficult and dangerous obstacles, has to fight and learn how to use weapons, and risk her life for others. She makes some friends, but struggles to see which of them are better to be with, either have friends that protect you when you are weak or have friends that acknowledge your strength. 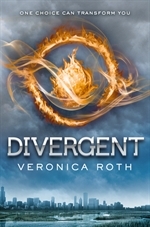 Beatrice, or Tris, then starts a relationship with a boy, when she finds out that something big is happening and society will be broken. She will have to risk her life and use her secret to save her family and friends, or everything will fall apart. In the beginning of the book, I thought it was going to be confusing because it started talking about Abnegation and the factions without saying anything about how society worked. Later, the story became easy to understand and it shows how people are not perfect and can be corrupted. The story is interesting and has details, and the setting is unique. The author, Veronica Roth, used some vocabulary words but not too much so younger readers could understand the book. The best part of this book would be the end of the book when the soldiers are attacking Abnegation and Tris has to save everyone and stop the Dauntless from killing people. I would recommend this book to high school students and older middle school students because it includes some romance. If I could go back in time, I would choose this book again because it is an engaging and hard to put down. I would rate this book nine out of ten stars. 1. Which factions can Beatrice join because of her divergence? 1a. Beatrice can join Abnegation, Dauntless, or Erudite. 2. What do the Dauntless do to get to the school? 2a. The Dauntless jump off a moving train. 3. How is the Erudite sole representative chosen? 3a. The person with the highest IQ is chosen as the representative. 4. What are in the bowls for choosing Abnegation and Dauntless? 4a. The Abnegation bowl has grey stones in it and the Dauntless bowl has sizzling coals. 5. What is at the bottom of the big hole Beatrice has to jump into? 5a. A net that catches the jumpers. 6. Why is Beatrice’s mother unable to visit Caleb? 6a. Erudite people do not want people from Abnegation in their compound. 7. What rank is Tris for stage one of the training? 7a. Tris is sixth place. 8. What building does Tris zipline off of? 8a. Tris ziplines off the Hancock building. 9. How does Four find out that Tris is divergent? 9a. Tris breaks the glass tank in the simulation. 10. What rank is Tris after stage two? 10a. Tris is first place. 11. What is Tobias’s theory on bravery? 11a. Tobias thinks selflessness and bravery are similar. 12. Why does Tris recognize Jeanine’s voice? 12a. Jeanine’s voice was in the aptitude test. 13. What fear does Tris find out about Christina when she opened a cabinet? 13a. Tris found out that Christina was afraid of moths. 14. What does Tris do to overcome her last fear in the fear landscape? 14a. She lets Jeanine shoot her instead of shooting her family.15. How does the Erudite plan on controlling the Dauntless? 15a. They inject transmitters into everyone to make them go into a simulation where they are controlled.